We are there to allow king feve collector to have access to feves of quality, becoming rather rare on the market, and during all the year ! We propose a wide choice of antique complete feve sets but also novelties of the year, don't hesitate to come regularly on www.fabofolies.com. In spite of our professional status, first of all we are feves lovers, our knowledge is at your service. Complete sets referencies result from books of the Association des Fabophiles Français as well as suppliers. We also purchase your feves if they are home-mades, personalized and old feves. Do not hesitate to contact us if you have treasures to propose to us ! Fabofolie's.com team wishes you a good shopping ! Old complete set of 3 feves from Eric et Gilles of 2016, Bonnet d'âne is waiting for you to complete your collection. 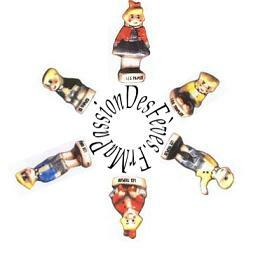 Complete set of 10 feves from Alcara of 2019, La jeunesse de Bécassine is waiting for you to complete your collection. Complete set of 10 feves from Alcara of 2019, Moi moche et méchant 3 is waiting for you to complete your collection. Complete set of 10 feves from Alcara of 2019, Princesse Schtroumpfette is waiting for you to complete your collection. Complete set of 10 feves from Alcara of 2019, Les minions à la plage is waiting for you to complete your collection. Complete set of 10 feves from Alcara of 2019, Associe les minions is waiting for you to complete your collection. Complete set of 10 feves from Alcara of 2019, Mission minion is waiting for you to complete your collection. Complete set of 10 feves from Alcara of 2019, Schtroumpfs écolos is waiting for you to complete your collection. Complete set of 10 feves from Alcara of 2019, Minions timbrés is waiting for you to complete your collection. Complete set of 9 feves from Prime of 2019, Service Hansi is waiting for you to complete your collection. Complete set of 8 feves from Alcara of 2019, Trésors de dessert is waiting for you to complete your collection. Complete set of 8 feves from Prime of 2019, Un coeur en or is waiting for you to complete your collection. Complete set of 8 feves from Alcara of 2019, Gâteaux et viennoiseries is waiting for you to complete your collection. Complete set of 10 feves from Prime of 2019, Ernest et Célestine is waiting for you to complete your collection. Complete set of 10 feves from Prime of 2019, Santiags is waiting for you to complete your collection. Complete set of 10 feves from Prime of 2019, Biscuits circus 3 chocolats is waiting for you to complete your collection.